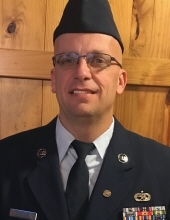 Kenneth Dean Wagner, age 43, born on November 29, 1974 in Middletown, OH, passed away on Friday, November 23, 2018 at his home in Sweetwater, TN. He was truly a follower of Jesus Christ, beloved husband, father, and grandfather. Ken was a member of Sweetwater First Assembly of God. Additionally, he served as Royal Ranger Commander, youth leader, mentor and coach. Ken gladly served in the United States Air Force for 22 years. He was employed at Precision Strip, Inc. for 22 years. He is survived by his wife of 18 years Kristi Lee Wagner, daughter Kayla S. Wagner, son Brayden J. Wagner, daughter Bethany P. Wagner, son Zachary M. Wagner, grandsons Braylen M. D’Alessandri and Kamron D. D’Alessandri, father Michael Wagner, mother Sue Wagner, grandmother Marilyn DeAngelo, brother Bryon M. Wagner, many loved ones, friends, and relatives. A honor guard receiving will be conducted at 9:30 A.M. before the visitation which will be 10am-12:00pm on Saturday, December 1, 2018 followed by service at 12:00pm at Solid Rock Church, Monroe, OH. With Pastor: Lawrence Bishop II. Memorials may be made to Solid Rock Church in Monroe, OH. Burial will be at Chattanooga National Cemetery, in Chattanooga TN on Friday December 7, 2018 at 11:00 A.M. Wilson-Schramm-Spaulding Funeral Home, Middletown, OH in charge of local arrangements. To send flowers or a remembrance gift to the family of Kenneth Dean Wagner, please visit our Tribute Store. "Email Address" would like to share the life celebration of Kenneth Dean Wagner. Click on the "link" to go to share a favorite memory or leave a condolence message for the family.